Heidelberg lies along the Neckar River in Baden Wurttemberg with approximately 140,000 residents. And it is no wonder why this city is one of Germany’s greatest tourist destinations. It offers magnificent views, pleasant walks through history, a castle in ruins, towering churches, cobblestone streets, great shopping and so much more. It’s a picture postcard city, which also has an strong relationship with the U.S. Army. The enchanting Heidelberg Castle dominates the skyline, nestled on a hill 300 feet above the City as the Neckar River flows beneath. Surrounding an inner courtyard, the castle consists of several buildings which represent different periods of German architecture. Since the city was connected to the railway network in 1840, the castle has been serving as the epitome of German romanticism for tourists from around the world. During the 16th and 17th century, it was one of the most magnificent palaces in Europe. With more than one million visitors annually, the Heidelberg Castle remains one of the most popular castle ruins of the world. The castle’s history is almost as old as the city itself. The first parts of the castle were constructed around 1300. Its usage as a regal residence began in 1398 and ended in 1764, after being permanently uninhabitable after lightning struck it. The conservation of the castle ruins began in 1800. Before its final destruction, the castle was destroyed several other times. The first destruction was during the Thirty Year’s War (1618-1648). The restoration was limited to the interior due to financial constraints. The French burned the castle (and town) during the War of Succession in 1689. Renovations were resumed for it to be destroyed again by the French in 1693 (something that is remmebered at the “Heidelberg Castle Illumination” spectacle mentioned below). The view of the city from the castle is simply spectacular, while clapping eyes on the ruins will transport you back in time. An English audio guide tour of the castle and the grounds is available. There is also a guided tour that gives access to the interiors of the Castle, which is off-Limits otherwise. The walk up to the castle can be quite strenuous but thankfully it is possible to take a cable car (Bergbahn) in two stages from the Kornmarkt in the Altstadt. In the summer, the cable car runs every 10 minutes. For the foodies amongst you, the castle is home to a stunning gourmet restaurant called Scharff’s Schlossweinstube. 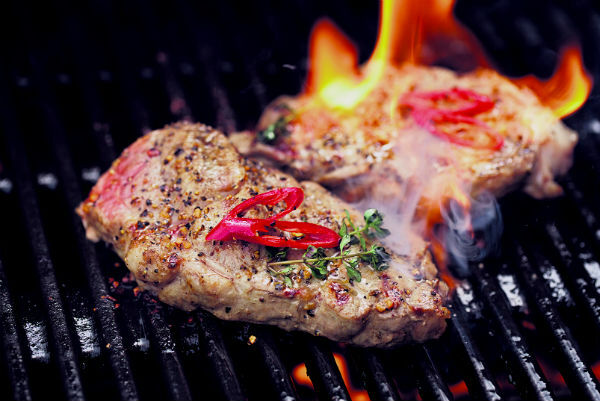 It boasts a celebrated Michelin Star so don’t expect it to be light on your pocket, but it certainly is a special venue for equally special occasions. During the months of June, July and September. the Heidelberg Castle stages an illumination and fireworks display that attracts thousands from near and far. The show begins with the castle being bathed in red light to represent the torching of the castle by the troops of Louis XIV in 1689 and 1693. The red then slowly fades as the second part of the show begins. The fireworks have been a part of the annual event for the last 401 years. It initially was started by Friedrich V, the Elector Palatine who arranged for his newlywed bride to be greeted with fireworks in 1613. Nested just below the castle is the Altstadt (Old Town), extending along the Neckar River for one mile with Karlstor at one end and Bismarckplatz on the other. You will find an eclectic combination of cobblestone streets, old and new buildings, narrow streets, market squares, arts, history, science, shopping and eating. Here are some other points of interest in the Old Town. The heart of the Altstadt is the Marktplatz, a very popular and lively square located between the Church of the Holy Spirit and the Town Hall. Since the Middle Ages, this is the place where public proceedings were held such as witches being burnt at the stake and petty criminals hung in cages for all to see. In the middle of the square you will also find the 18th century baroque fountain Herkulesbrunnen (Hercules Fountain). An outdoor market is held every Wednesday and Thursday. The Church of the Holy Ghost (Heiliggeistkirche) is Heidelberg’s most famous church in the middle of the Altstadt with its steeple rising above all roofs. Although the church was first mentioned in a manuscript from 1239, the foundations of the current church was laid in 1398 with the tower finally being completed in 1544. In the 14th century, it became the church for the University of Heidelberg. Through the centuries the church was simultaneously home to Catholics and Protestants but became exclusively Protestant in 1936. Though the church used to contain the Palatinate electors’ tombs, only the founder of the church, Prince Elector Rupert III, is preserved on the premises today. The other tombs were destroyed by a fire during the War of Palatinian Succession. Kornmarkt (Grain Market), near the Town Hall and the Heiliggeistkirche, is the oldest square in Heidelberg and a favorite place to take pictures. 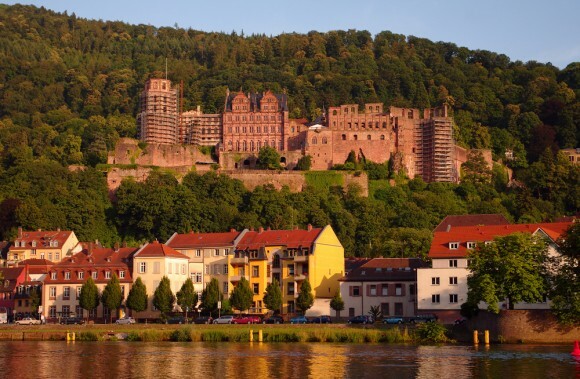 Located at the foot of the Heidelberg Castle, you can see the incredible view of the castle from there. Not only will you be astounded by the view, but the beautiful architecture of the old buildings and cobblestone streets will amaze you further. Also in the center of the square is a golden statue of the Mother Mary, which was erected in 1685 as a futile attempt to convert the Protestants back to Catholicism. From the Kornmarkt, you have three choices to ascend to the top of the castle. You can ride the funicular (cable car), walk along a steep winding path or take more than 300 steps to the top. The Old Bridge (officially, Carl Theodor Bridge) has nine red sandstone arches spanning across the Neckar River and leading into the Altstadt. It has been immortalized by countless painters and poets like Friedrich Hölderlin and Gottfried Keller. The Bridge was initially wooden and has been rebuilt nine different times. The last destruction occurred in 1945 with German soldiers blowing it up to make it impassable. The bridge was then rebuilt in 1946 and added to the World Monuments Fund in 2001, a list of the world’s most endangered monuments. Today you can still see a medieval gate, which was part of Heidelberg’s original town wall. The bridge also has several towers (including dungeons) and many monuments and sculptures including one of a Brass Monkey, which is supposed to bring luck and fertility when you touch his er…private parts! The Palatinate Museum has comprehensive collections of art and cultural spanning over a period of several millennia. Though the main focus of the museum is the history of the Palatinate region and the city of Heidelberg, there are items from other parts of Germany, France, Italy and the Netherlands. Exhibits cover Palatinate pre and early history of archaeology collection to painting, prints and drawings in the 20th century as well as other painting, graphic art, crafts and urban history. The archaeological section focuses on the past 600,000 years of Heidelberg’s civilization including an exhibit on the Roman presence as well as artifacts from the early Middle Ages. The extensive collection of paintings and sculptures date back to the late 1400’s including works from the famous artist Tilman Riemenschneider as well as 19th and 20th century artists Wilhelm Lehmbruck, Karl Schmidt Routtluff and Max Beckmann. Synagogue Square is a memorial to a synagogue that was built in 1877/78 and burned down by the Nazis in 1938. The city re-built the square in 2001 based on the original layout of the synagogue. The white marble paving stones mark where the walls of the destroyed synagogues once stood and the gray granite represents the windows and entrance. The twelve sandstone cubes symbolize the pews as well as the twelve tribes of Israel. The University of Heidelberg, the oldest university in Germany, was founded by Rupert I, Elector Palatine in 1386. Initially it served as the center for theologians and law experts throughout the Holy Roman Empire. Today the university has twelve faculties and more than 30,000 students. It offers degrees at undergraduate, graduate and postdoctoral levels in some 100 fields. It is ranked one of the top overall universities in Europe. The university emphasizes on research and has been associated with 55 Nobel Prize laureates. 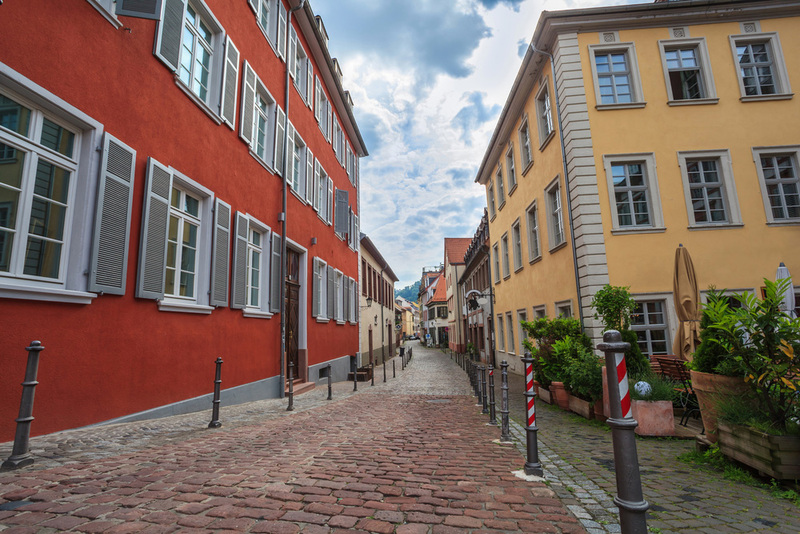 To observe the vibrant university life, head to the Untere Strasse, which is a narrow cobblestone street that runs parallel to the river and Old Town. There you will find great a huge number of buzzing bars, coffee shops and eateries frequented by students. At night this place really comes alive. 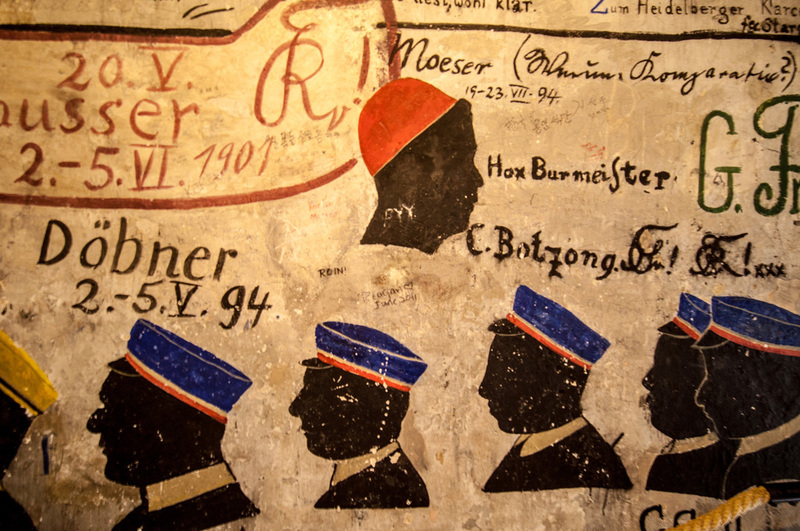 From 1778 to 1914 misbehaving students of the University of Heidelberg were incarcerated in Karzer Student Prison for offenses such disturbing the peace, excessive drinking or womanizing. These minor offenses would lead to three days up to four weeks at a time in jail. The prisoners were allowed to attend class but had to return to the cells afterward. While detained the students decorated the walls with paintings, graffiti, verses and artwork. The Hauptstraße, main road leading through the Altstadt, is one of the most popular shopping areas of the city. Along with several other streets, it becomes the longest pedestrian street in Europe with 1.6 kilometers. There you will find an array of boutique stores, coffee shops, restaurants, bars and other businesses. On the northern side of the Neckar, the southern side of the Heiligenberg (Saints’ Mountain), is where you will find Philosopher’s Walk. During the Romantic Period, this is the pathway philosophers and the university professors took perhaps to get inspiration from the solitude of the forest and incredible views. Farther up the mountain you will find the 11th century ruins of the Monastery of St. Michael, a Nazi-era amphitheater and the remains from a 4th century BC Celtic hill fort. Taking a stroll along this path provides a great opportunity to see from above fantastic views across the Neckar River to the castle as well as beautiful flanking gardens. You will also see some of the city’s beautiful luxury villas. It is recommended to wear good walking shoes and it is not recommended for those who have walking difficulties – this is a strenuous walk – but totally worth it. Take a stroll along the Neckar with its picturesque views of the city, the castle and the Old Bridge. 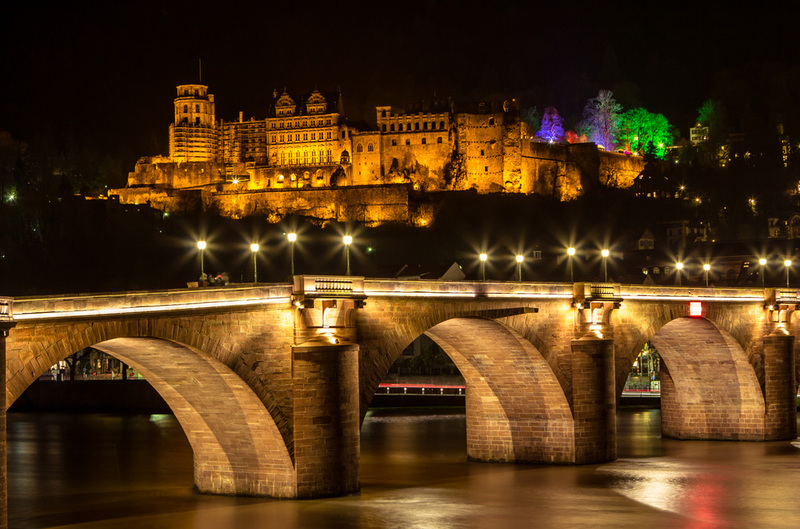 The bank serves as a hangout for locals and tourists alike and is the perfect location to enjoy the Heidelberg Castle Illumination. And if the weather is nice, you can have a picnic on the northern side of the river near the Theodor Heuss Bridge. During WWII, Heidelberg was one of the few cities in Germany that was not significantly damaged by Allied bombing. The U.S. Army entered the city of Heidelberg on March 30, 1945 and soon after the war as it was situated in the “American Zone”, it became the established headquarters of the American forces in Europe for several decades, as well as serving as NATO’s headquarters. Schools, hospitals and housing were quickly built around the city to accommodate the growing Army Garrison, creating a wonderful opportunity for many Americans to experience German culture. But what was once the centre piece of Army life in Europe is not for much longer. By 2015, all US forces will have moved out of Heidelberg and the barracks and housing areas will be handed back to the German state for conversion back to civilian use. Over the decades tens of thousands of American service men and woman and their families have been stationed in this beautiful old town and made a home here amongst the historic cobblestones of the city. German-American friendships have been forged, marriages made and memories created along the fast-flowing banks of the Neckar. Make sure you visit Heidelberg whilst you are in Germany and experience some culture that is as much American as it is German. That’s a pretty unique experience. Getting to Heidelberg is pretty easy due to it’s central location to all US bases, but it’s a pedestrianised city centre, so if you take your car there, you will need to leave it in a parking garage for the day and travel around the city on foot or with the street cars. It takes just an hour to reach Heidelberg by car from Kaiserslautern or Wiesbaden, and about 1hour 15mins from Stuttgart. By Deutsche Bahn it takes 1hour 15mins from Kaiserslautern and Wiesbaden and can be as quick as 40 mins from Stuttgart.